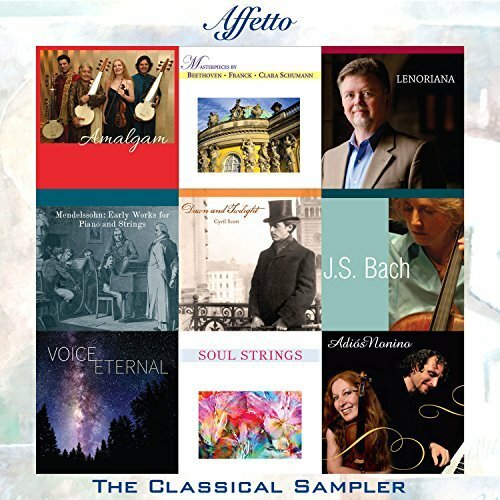 The Affetto Classical Sampler, featuring nine tracks from our nine album releases, is out and it’s Free on Amazon. Listen to the spellbinding work of Grammy-nominated violinist Elmira Darvarova teamed with Indian sarod masters the Ali Khans, from “Amalgam” and “Soul Strings” albums. Cellist Kate Dillingham and harpsichordist Jory Vinikour, play a movement from J.S. Bach’s De Gamba Sonatas from a new Schirmer edition edited by Ms. Dillingham. Listen to a track from “Masterpieces by Beethoven / Franck / Clara Schumann” by Elmira Darvarova on violin and Shoko Inoue on piano. Rutgers University’s exquisite early music ensemble Musica Raritana, led by Dr. Andrew Kirkman, performs Mendelssohn’s earliest work for piano and strings. Elmira Darvarova (on her fourth Affetto album!) and the late Octavio Brunetti perform tangos by Piazzolla from “Adios Nonino” with incomparable spirit and passion. Download this album now, for free, to hear the wonderful diversity Affetto brings to the world of classical music.